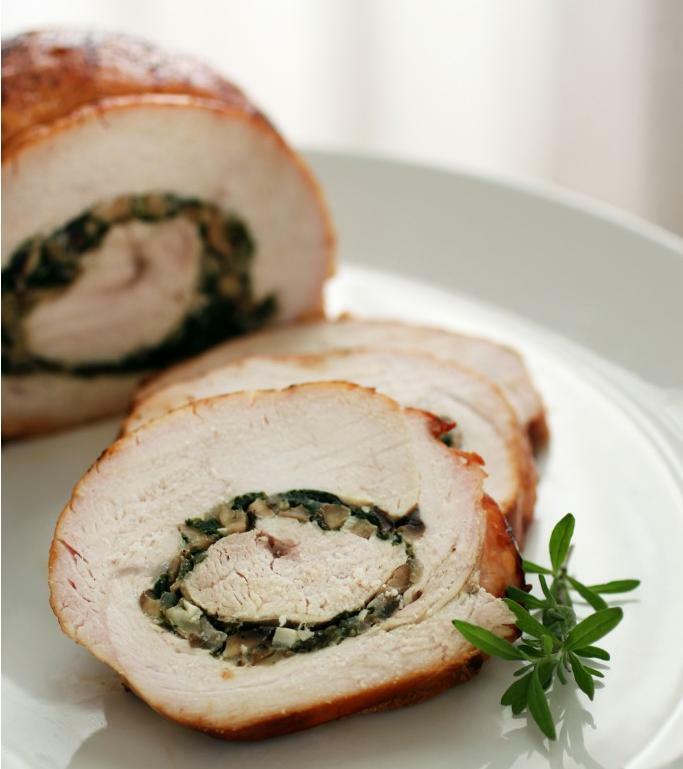 Time to up the stakes (apologies for the food pun) as we try to master this pretty difficult nightshade free stuffed turkey breast recipe. I don’t know about you, but I under utilize turkey meat even though I love it when its cooked right. It’s also economical and the meat is perfect for leftovers. Preheat oven to roast at 375°F. In a non stick skillet, sauté mushrooms, baby spinach, onion, garlic, and rosemary in 1 tablespoon olive until mushrooms have softened slightly. Carefully remove skin from turkey and set aside. Place turkey breast, skin side down on a large cutting board. Spread halves of breast apart, so the turkey breast opens like a book. Release thickest tenders of meat with a sharp knife so that you can open the breast more to create an even thickness of meat. Cover turkey breast with parchment paper and carefully pound to even thickness with a meat mallet (or cast-iron skillet like we had to resort to using). You want the meat to be as even as possible without damaging the breast. Spread stuffing over turkey and tightly roll the breast for roasting. Cover the stuffed breast with the reserved skin, and tie with kitchen twine in three evenly spaced intervals to keep skin in place. Lay stuffed breast in a roasting pan or baking dish, seam side down. Roast at 375°F for about 2 hours and 30 minutes, or until the roast has reached 175°F in the breast. Many thanks to primalpalate.com for recipe idea and image.